Analysis projects can be carried out in a variety of ways with STATISTICA. For Enterprise and Data Miner users, one option is the Workspace, which provides a visual way of performing your analysis tasks that additionally makes the process repeatable. The Workspace shows a symbolic representation of the flow from the input data through any data preparation and cleaning steps to exploratory and analysis tools. The flow continues to the output reports. Visual – The project is laid out visually to show the workflow from input data to the results. Repeatable – Run the Workspace multiple times as data update or even on new data sets. Reproducible – Project steps are laid out visually and can be explored to see exactly what was done to obtain the results. Flexible – The same analysis options are available in the Workspace that you have in the original interactive analyses. Customizable – Custom nodes can be created for the Workspace and shared with colleagues. The Workspace became more flexible in the most recent versions of STATISITCA, offering a new type of node in addition to the scripted nodes offered before. The Workspace is easier to use and offers much more flexibility. Some nodes are still in Beta version. New nodes, Beta nodes, and the previous style of scripted nodes are all available to you and can be used together in a single Workspace project. Workspace nodes can be accessed not only from the Node Browser, but also from the menu structure you are already accustomed to using. When a Workspace is active, the Statistics, Data Mining, Graphs, and Data tabs change to the Workspace node tabs. Selecting an analysis or tool from the tabs will add the appropriate node to the Workspace. Visually, STATISTICA indicates this by highlighting the tabs as seen here. The group of nodes available is governed by the selected configuration from the drop-down menu found at the upper-right corner of the Workspace. The configuration can be changed at any time, and both the available nodes on the tabs and in the Node Browser are updated accordingly. Output management within the Workspace is more flexible. On the Workspace tab of the global Options dialog box, options are available to route output. By default, all results will be sent to one workbook node to organize all output together. The scripted nodes have always been part of the Workspace and are still available for use in all Workspace projects. These nodes are indicated in Version 12 with SVB at the top of the node as seen below. If you are familiar with the Workspace from past versions of STATISTICA, these nodes still work the same way. Variable selection is performed in the input data node. The nodes that are new with Version 12 (as well as those still in Beta) work differently from scripted nodes. They are more flexible and have more options. Selecting variables. Each new node for data preparation, analysis, and graphing contains options for variable selection, case selection conditions, weighting, etc., all available in the node dialog box. In scripted nodes, variable selection is performed at the node prior to the analysis node. The new functionality gives you greater flexibility within each individual analysis to easily control the settings. Different variable selections, weights, selection conditions, etc., can be used for each analysis. Alternatively, the Select Variables node accessed from the Data tab in the Variables group offers variable selection one time where downstream analyses will inherit the same variable selection. The option that works best for your analysis is easily available to you. The Select Variables node may be necessary when using a combination of new nodes and scripted nodes in one Workspace. 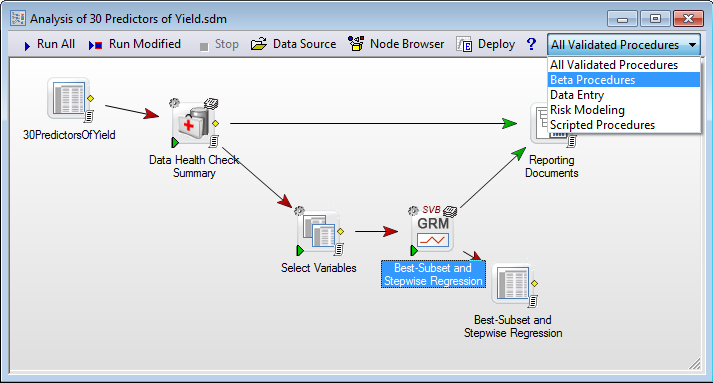 In the example below, the Data Health Check node output is used as input for the scripted regression node, Best-Subset and Stepwise Regression. To use this new node output as input, variable selections must be made before the scripted node as shown below. Selecting options and output. The available options for these new nodes are the same as what you are accustom to in the original interactive analyses. The new node dialog boxes have a similar appearance and are easier to navigate than the previous scripted nodes. Both the set up for the analysis and the results options are located in one dialog box. Use the tree pane on the left to navigate through the tabs, and make all desired selections before running the node. Check each desired result item you want to be included in the output. Some nodes offer spreadsheets for downstream analysis that can be selected and customized as well. Highlighting the input data node to be used for input before selecting the analysis node will automatically connect the input data to the node. Options such as Run to node and Run modified nodes make it possible for you to execute only portions of the Workspace at a time. Right-click on a connection and select Disable to temporarily avoid an analysis connection and everything downstream from it. When running STATISTICA 12, if you don’t see the same node configurations as in this article, you likely need to restore the default settings of the Node Browser. In the Browser Options dialog box, click the Restore Defaults button to remove the customizations and show the Beta Procedures and other standard lists for Version 12.